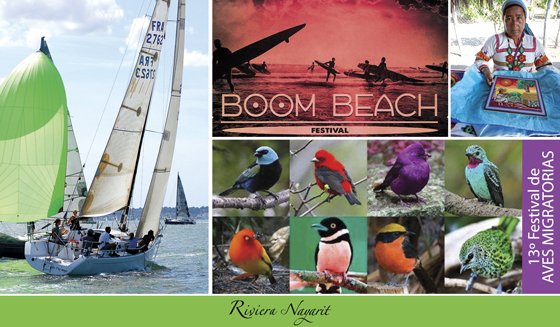 The year begins with the Vallarta Cup Race Series and the Nuevo Vallarta Art Festival, the Patron Saint Festivities for Our Lady of Peace in La Cruz and Bucerías and the International Migratory Bird Festival in San Blas. The year is still not over in the Riviera Nayarit and the Groups and Events desk at the Riviera Nayarit Convention and Visitors Bureau (CVB) is already working on what’s coming up for 2017 and lending their support to the first events of the year. “As a tourism destination we are known for hosting dozens of events throughout the year, and that’s exactly how we’re ending 2016 and kicking off 2017,” said Marc Murphy, Managing Director of the Riviera Nayarit CVB. It’s all about fun during this Stand Up Paddle (SUP) and surfing competition in Lo de Marcos, held to promote sports and environmental awareness. This is a great excuse to go camping for a weekend and try out your balance on a board. In order to celebrate their patron saint, local citizens head out on a maritime pilgrimage on their gaily-festooned boats from La Cruz de Huanacaxtle to Bucerías. San Blas is undoubtedly one of the top migratory and endemic bird watching areas on the continent. Several artistic and cultural activities revolving around the birds will be held during the festival, as well as tours along the traditional observation routes.